The 2016 Fiat 500X is a winner for its standout looks and upscale driving feel, but those traits don’t come cheap. The problem with designing an adorable car like the Fiat 500 is that every model that follows is judged according to the original’s styling. That’s why Fiat’s first attempt to expand its lineup, the 500L, has failed to thrive. But you know they’ve done something right with the 500X when three different people mistook it for the original 500 hatchback, asking me when it got so much bigger. No doubt, Fiat’s designers have done a great job incorporating the hatchback’s iconic styling cues into this subcompact crossover’s looks. The resemblance carries through to the 500X’s interior, which nonetheless embodies the more grown-up feel expected by buyers comparing the 500X to competitors like the Honda HR-V and Mazda CX-3, and those moving up to this crossover from the cutesy hatchback. Sharing its underpinnings with the Jeep Renegade, the 500X comes with a choice of either a 1.4-litre turbocharged or a 2.4-litre naturally aspirated engine. Our tester had the larger of the two: its 180 hp and 175 lb-ft of torque offer a good deal more power than most competitors, chief among them Honda’s HR-V, the Mazda CX-3 and the Chevrolet Trax. The 500X moves just fine, but a heftier curb weight erases much of the performance advantage its stronger-than-average engine affords. The real penalty, though, is in fuel consumption: our tester averaged just under 13.0 L/100 km in a week of winter city driving. That’s high relative to the car’s 11.0 L/100 km city rating, according to Natural Resources Canada, and a lot higher than ratings for the thriftier HR-V and CX-3. The 500X’s 1.4-litre engine is more efficient, but it can only be had in this car with a manual transmission and front-wheel drive. Our tester had the requisite nine-speed automatic and optional AWD. On the plus side, the 500X’s weight gives the car a stable, and very European, driving feel. Handling is nothing to write home about, but it feels comfortable at highway speeds in a way that the lighter Honda and Mazda can’t quite match, though both of those cars are more fun on a twisty road. 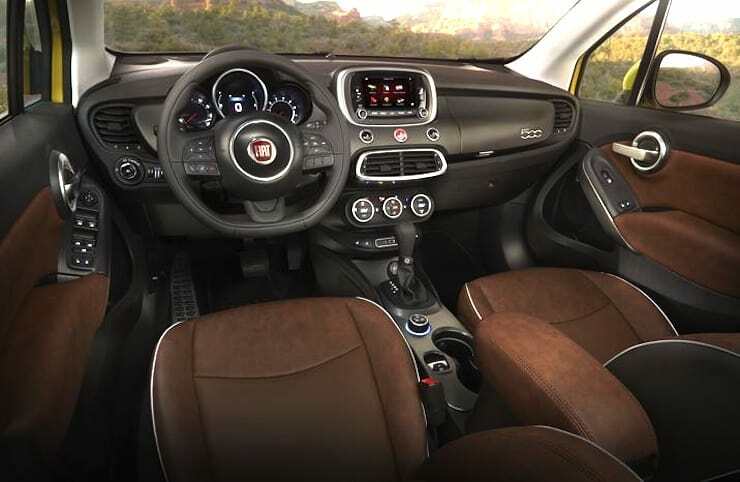 Something about the 500X’s exterior gives the impression of an interior roomier than its subcompact designation would suggest, but the reality is that this car is built for people of average stature, whether you’re driving or riding in the back seat. If anything about its interior dimensions impresses, it’s the cargo space, but even that is compromised by the body’s hatchback profile; the mechanically similar Jeep Renegade has a more useful cargo area. Other 500X annoyances are a noisy air conditioning fan, a speedometer that’s hard to read at a glance, and cheap-feeling plastic throughout the interior. If you concentrate on the features included in my 500X tester — heated steering wheel, lane keep assist, blind spot monitoring, navigation, and a dual-pane sunroof — a $36,000 price tag doesn’t seem out of line, but when you consider its decidedly compact cabin and unimpressive fuel efficiency, it starts to look like a weak value. The 500X is a winner for its standout looks and upscale driving feel, but those traits don’t come cheap, and we’re not sure they outweigh this crossover’s practical shortcomings. The XE is Jaguar’s entry level offering but sure doesn't feel like it. We review the 2017 Jaguar XE 2.0d R-Sport and 3.5t R-Sport.